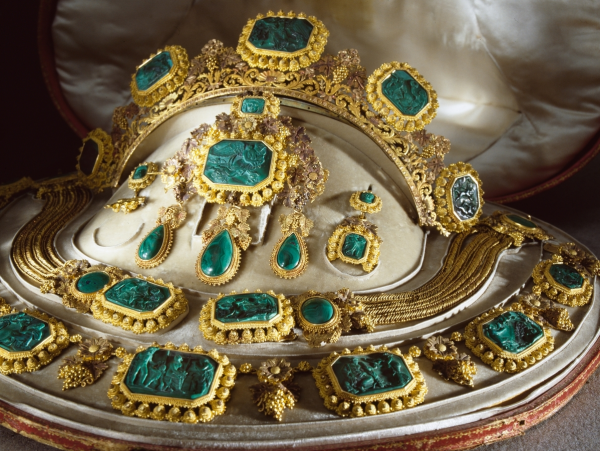 The Swedish royal jewel collection is enormous -- so vast, in fact, that a century ago the family decided to donate an entire parure of unusual royal jewels to a museum! 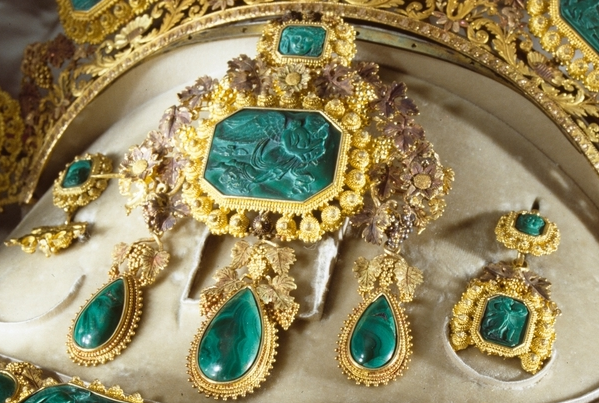 Today, we've got a closer look at that set: the gold and malachite parure that originally belonged to Queen Desideria. The parure was made some time during the 1820s or 1830s by Simon Petiteau, a Parisian jeweler who catered to high-society clients. One of these was Desiree Clary, the wife of Jean Baptiste Bernadotte. 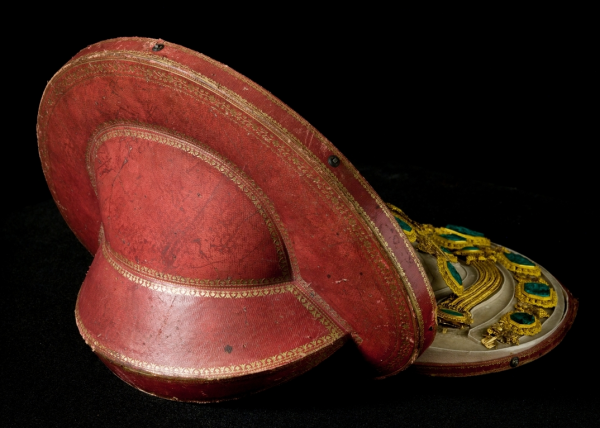 She had once been engaged to Napoleon Bonaparte, but she eventually married Bernadotte, who was one of Napoleon's most trusted military generals. Although she didn't marry an emperor, it turned out that Desiree married a king: Bernadotte was elected heir to the Swedish throne in 1810. Unhappy in her new Scandinavian home, Desiree moved back to Paris, and the suite of jewels was probably made during the period when she lived there without her royal husband. But Desiree was finally wooed back to Sweden by her husband and son, and she was crowned Queen Desideria in 1829. The suite of jewelry, which is made of gold and malachite stones, features design links to the Bernadottes' new regional home. Many of the malachites are carved with mythological images after the work of the Danish/Icelandic sculptor Bertel Thorvaldsen. The malachites are set in intricate gold designs, including leaf and floral elements. The necklace features four different shades of gold, helping to emphasize the dimensional nature of the jewels. 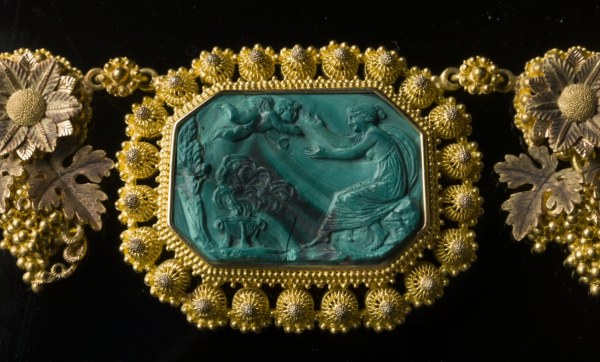 Malachites were extremely fashionable stones for use in jewelry during the nineteenth century. The parure consists of several pieces, including a tiara and comb (wearing the two together was fashionable during the first quarter of the nineteenth century), a necklace, two bracelets, a large brooch with pendants, and a pair of earrings. Above, you can see the large brooch and the earrings, one of which is missing its pendant section. 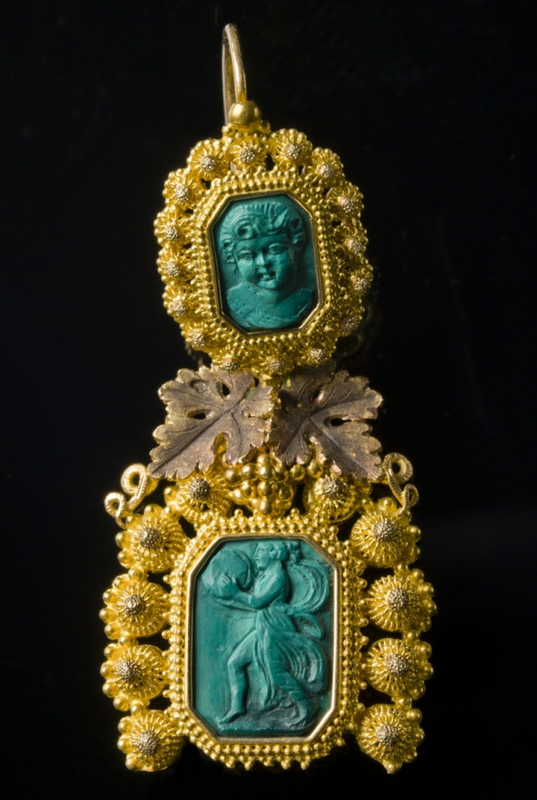 Note that the pendants of the brooch have been left as smooth cabochons, unlike most of the rest of the malachites in the suite. Here's a closer look at the complete earring. I don't believe we have any extant photographs or portrait paintings of any of the Swedish royal ladies actually wearing this suite, which is too bad -- I'd love to see how the jewels look on an actual wearer. Although no portraits seem to exist, the jewels belonged to three queens of Sweden. 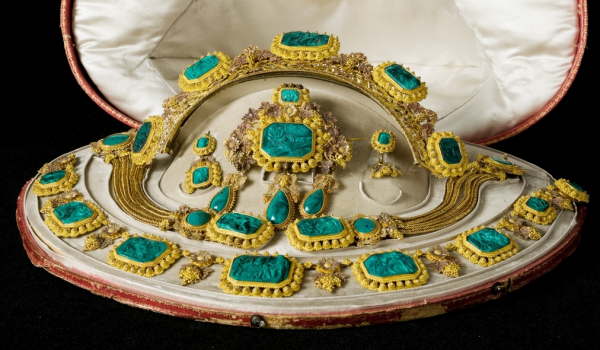 When Queen Desideria died in 1860, the malachite parure was included in the inventory of her jewels. It was bequeathed to her daughter-in-law, Queen Josefina; the set was also listed in her jewel inventory following her death in 1876. The last royal owner of the suite was Josefina's daughter-in-law, Queen Sofia. After her death in 1913, the royal family decided to give the parure to the Nordic Museum, Sweden's largest museum of cultural history. 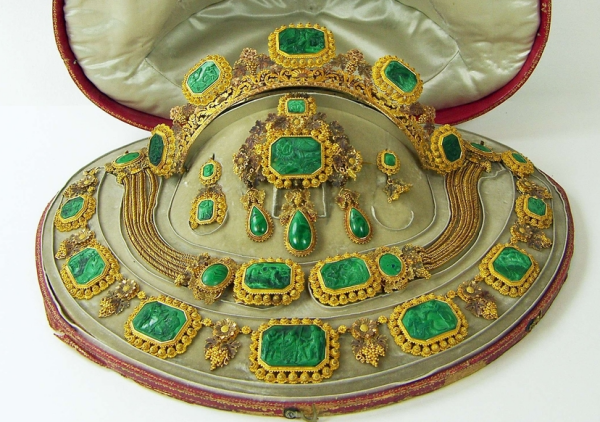 The museum, which is located in Stockholm, received the suite of jewels (and its elaborate red case) in May 1914, and it has been in their collection ever since. Perhaps it's for the best that this design treasure was sent to a museum, where it could be studied and enjoyed by the public at large. But I can't help but wish that some of the jewelry innovators of the current generation of the Bernadottes, including the clever Queen Silvia, had had the chance to take a crack at wearing these!